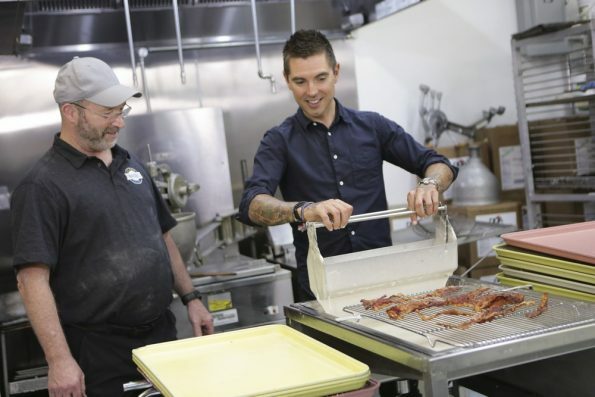 Host and Chef Jeff Mahin is meeting bakers in Jacksonville, Florida, who are redefining what it means to make epic desserts in The Cooking Channel’s newest show, Epic Sweets. From a 3 foot tall Donut tower, to a 12” éclair cake, to a breakfast fruit pastry 16 times bigger than the one you remember from your childhood, Jeff meets the extraordinary bakers who are making these epic sweets come to life. Mahin spent much of his teen years using his natural talent and instinct to construct and deconstruct whatever foods he touched within his family’s kitchen. At age 17, Mahin began his professional training at the California Culinary Academy and later studied science and mathematics at University of California, Berkley. Mahin has had experience working in prestigious kitchens around the country from Nobu in New York City to San Francisco’s Millennium, Blackhawk Grill and Patrick David’s. In 2006, he became a laboratory assistant at the three-star Michelin rated restaurant, The Fat Duck in Bray, Berkshire, England under chef/owner Heston Blumenthal. In 2007, Mahin headed back to the U.S. where he assisted famed chef Laurent Gras in opening L2O in Chicago, LEYE’s Michelin-starred, modern seafood restaurant. He then started as a corporate chef within LEYE, collaborating closely with the hospitality group’s partners including Lettuce founder Rich Melman to develop new recipes for the group’s more than 100 restaurants. Mahin opened his first LEYE concept, artisanal pizzeria Stella Barra Pizzeria, in Santa Monica in 2011 with LEYE managing partners R.J. and Jerrod Melman. There he experimented with more than 30 different variations to create restaurant’s signature pizza crust, using locally-milled flour and farmer’s market ingredients to make up the ever-changing menu. His California concepts also include M Street Kitchen in Santa Monica and a second location of Stella Barra in Hollywood. In 2012, Mahin expanded to Chicago, partnering with Chef Francis Brennan to open artisanal doughnut shop Do-Rite Donuts and in summer 2014, Mahin and Brennan opened the second Do-Rite location in downtown Chicago’s Streeterville neighborhood. Do-Rite’s doughnuts are prepared daily in small batches and utilize seasonal ingredients like Meyer lemon in the winter and fraise des bois in the spring. In addition to Do-Rite, Mahin increased his Chicago presence in fall 2013 with two new Lincoln Park restaurants: his third iteration of Stella Barra, as well as a new concept, Summer House Santa Monica, bringing laid-back California-style cuisine to the Windy City. Designed to evoke a laidback, friendly vibe reminiscent of the Golden State, Summer House serves an ever-changing menu that spotlights locally-sourced produce and ingredients whenever possible, and also boasts Mahin’s signature artisanal bread program. In early 2015, Mahin expanded to the Washington, DC market, opening the fourth location of Stella Barra and the second location of Summer House Santa Monica in North Bethesda, MD. Mahin is also an ambassador for Chefs Cycle, a fundraising endurance event featuring award-winning chefs fighting childhood hunger outside the kitchen. Last year, Jeff and over 100 other chefs from around the country raised over 1 million dollars to battle childhood hunger in the U.S. Next year, Jeff plans to ride across the U.S. with fellow chefs to raise money and awareness for No Kid Hungry and Chefs Cycle. When Mahin isn’t cooking or riding his bike, he can be seen on a variety of cooking shows including Sugar Showdown on Cooking Channel. He also has a passion for health and nutrition, and enjoys discussing food and with some of the country’s leading nutritionists. Had a great time with this interesting post. Happy to know more about the excellent Chef Jeff Mahin here.